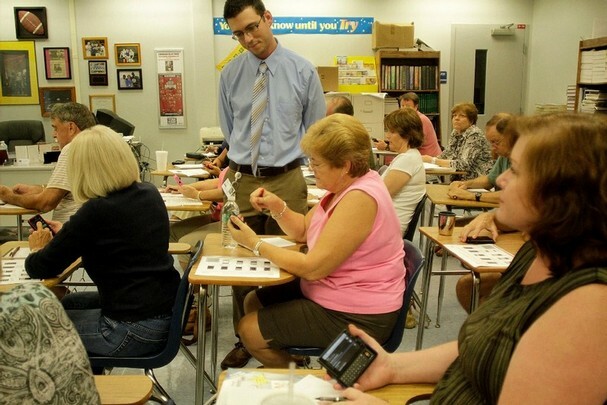 Apparently in Naples, Florida, retirees are flocking to Droid adult eductaion courses which cost $69 for a series of 6 (Steal!). At these classes you’ll run into power users like Bob Graham, a 70-year old Tommy Bahama’d real estate broker who finds the screen on his Droid to be a bit too sensitive, but that’s nothing compared to the complexity of his QWERTY keyboard (because standard is confusing). You may even learn to use Shopsavvy, one of the 10,000 apps available (wait only 10K? ), which one silver-haired fox claimed would save her enough money to pay for her new phone and more! Get right out of the Villages with that! What’s even more impressive though, is that you’ll learn how to set up a new wallpaper, which in a smaller class, should only take about 25 minutes to do. And when the teacher asks you to stand up in class to introduce you and your Droid, be prepared for the middle-aged man in the front row to stand up with force and yell to the class, “Get the Droid X!” because after all, they are still backordered and he wants everyone to know that his pension paid for his on launch day. But don’t worry if you are still rocking one of the other 40 Droid phones (that seems like a lot), as I’m sure Verizon will just keep manufacturing more (huh?) for you to upgrade to. More on the story at NaplesNews.com. Best Buy Expecting Verizon LTE Devices "This Fall"